The episodes of war and human conflicts are persistent when it comes to the rich tapestry of history. And in such a vast ambit of wanton destruction and death, there have been a few civilizations, tribes and factions that had accepted warfare as an intrinsic part of their culture. So without further ado, let us take a gander at ten of the incredible ancient warrior cultures that pushed forth the ‘art of war’ (or rather the art of dealing with war) as an extension of their social system. Note 1 – In this list, we are NOT implying the ten greatest ancient warrior cultures, but rather implying ten OF THE greatest ancient warrior cultures (before Common Era). Preference for choosing the said cultures is partly based on their variant geographical power-centers. Note 2 – The list doesn’t reflect the cultures’ successes in battles or wars, but it pertains to how they perceived the scope of war or conflict (from a social perspective). Akkadian archer wielding a composite bow, while being protected by an infantryman. Circa 2334 BC, the Akkadians carved up the first known all-Mesopotamian empire, thereby momentously uniting the speakers of both Sumerian and Akkadian. In fact, by the middle of 3rd millennium BC, the Akkadians managed to create a culturally syncretic scope (that encompassed a melting pot of different ethnicity and city-states), which ultimately paved the way for the emergence of Akkadian as the lingua franca of Mesopotamia for many centuries to come. However, beyond just cultural affiliations with the advanced Sumerians, the Akkadians also adopted (and loaned) many of the military systems and doctrines of their Mesopotamian brethren. One example of such ‘transmission’ of military ideas relates to how the Akkadians probably fought in a phalanx-like formation long before the Greeks (as did the soldiers of the Sumerian city-state of Lagash). This tactic in itself alludes to how the soldiers of Akkad must have been disciplined and trained, thus hinting at their professional status, as opposed to most ancient armies. A few steles also showcase how the Akkadians (and their preceding Sumerians) made use of the armored cloak – a panoply that probably consisted of a leather skin (or cloth) reinforced with metal discs; and helmets for further protection in brutal melee combats. 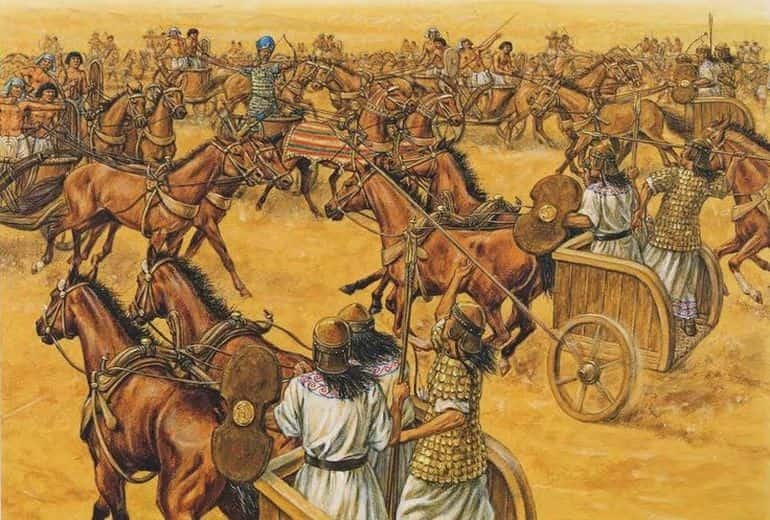 But the practical superiority of the Akkadian (and Sumerian) warrior culture must have related to the use of wheels – an invention that not only allowed for more complex logistical support but also heralded the development of chariots, the ponderous heavy shock weapons of the Bronze Age. Moreover, Sargon of Akkad, possibly the first known military dictator of an empire, implemented the use of composite bows in his otherwise lightly-armed citizen army. Historically, the effective range and punch of such powerful bows (in the hands of skilled archers) surely must have given the Akkadians the military advantage over their Sumerian neighbors – many of whom still relied on javelins. The Hittite chariots (on right) clashing with the Egyptians at the Battle of Kadesh (circa 1274 BC). Illustration by Adam Cook. Almost 3,700 years ago, a power rose in central Anatolia thus effectively making its presence felt in the ancient Near-Eastern world. Historians term the realm as the Kingdom of Hatti, and its inhabitants are known as the Hittites. By late 14th century BC, the Hittites probably controlled the most powerful empire of the Bronze Age, with their dominions stretching all the way across Anatolia to touch the Aegean Sea, while being complemented on the east with their expansions into Syria (and finally even Mesopotamia) with the defeat of their longtime rivals, the Mitanni. Interestingly enough, the martial culture of the Hittites was often represented by their kings who were also the commanders-in-chief of their armies. In essence, kingship was intrinsically tied to the display of martial prowess and commanding capability on the battlefields; and as such the kings were expected to prove themselves in battles. Because of such an ingrained cultural aspect, the future candidates (for kingship and other elite political roles) were often trained in warfare skills from their childhood. To that end, much like warlords, many of the Hittite kings led their troops in the thick of the battle and possibly even engaged in melee combat with the enemy. However, in most practical scenarios, the ruler probably donned his role of a commander and directed his troops from protected vantage points. As for the composition of their armies, most of the Hittite infantrymen were lightly armed with spears and rudimentary shields. But much like other contemporary powers (of both Near East and the Mediterranean) the elite section of the Hittite army was composed of chariots. In that regard, by the time of the momentous Battle of Kadesh (circa 1274 BC), the Hittites probably ‘modified’ their chariot-based tactics by placing three men on the vehicle (as opposed to two men). And while this made the chariot more ponderous, it was compensated by the extra protection offered by a shield-bearer who guarded the other two armed with throwing spears and bow-and-arrows. This technique, though risky, might have been instrumental in shattering the first division of their Egyptian foes, thus providing the Hittites with the initiative in the encounter. According to Xenophon, the crimson robes and bronze shields carried by the Spartans were mandated by their legendary lawgiver Lycurgus. An ancient warrior culture that has often been exaggerated in our popular media, the Spartans nevertheless espoused their brand of rigorous military institutions. 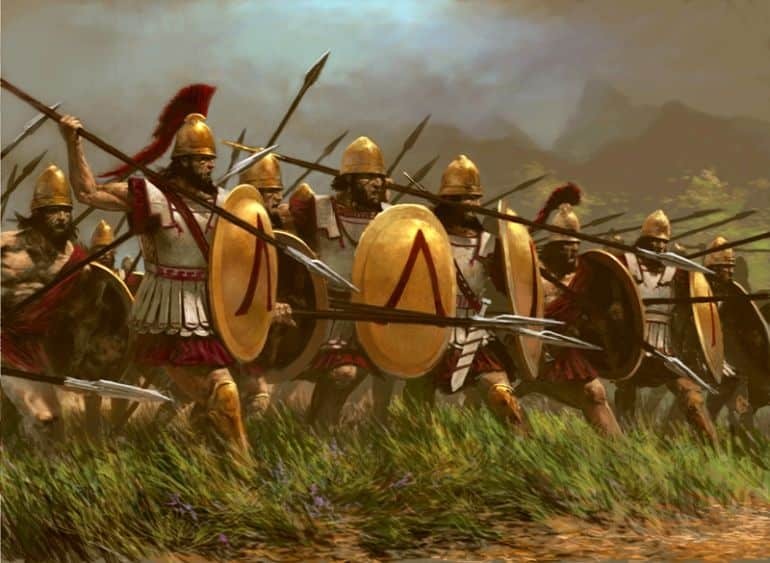 In fact, the Spartans (or Lakedaimonians) maintained the only full-time army in all of ancient Greece, while their social structures were geared towards producing hardy soldiers from ordinary citizens. One prime example of such a military-oriented scope obviously pertains to the agoge – the Spartan regimen for boys that combined both education and military training into one exacting package. The agoge was mandated for all male Spartans from the age of 6 or 7 when the child grew up to be a boy (paidon). This meant leaving his own house and parents behind and relocating to the barrack to live with other boys. Interestingly, one of the very first things that the boy learned in his new quarters was the pyrriche, a sort of dance that also involved the carrying of arms. This was practiced so as to make the Spartan boy nimble-footed even when maneuvering heavy weapons. Along with such physical moves, the boy was also taught exercises in music, the war songs of Tyrtaios, and the ability to read and write. By the time, the boy grew up to be 12, he was known as the meirakion or youth. Suffice it to say, the rigorous scope was notched up a level with the physical exercises increased in a day. The youth also had to cut his hair short and walk barefooted, while most of his clothes were taken away from him. The Spartans believed that such uncompromising measures made the pre-teen boy tough while enhancing his endurance levels for all climates (in fact, the only bed he was allowed to sleep in the winter was made of reeds that had been plucked personally by the candidate from the River Eurotas valley). Added to this stringent scope, the youth was intentionally fed with less than adequate food so as to stoke his hunger pangs. This encouraged the youth to sometimes steal food; and on being caught, he was punished – not for stealing the food, but for getting caught. And finally, on turning eighteen, he was considered as an adult and a soldier of the Spartan society but was still prohibited from entering a marketplace to talk with his fellow adults till the age of 30. In consideration of all these strict rules, Plutarch once observed that the only rest that a Spartan got from training for war was during the actual war. 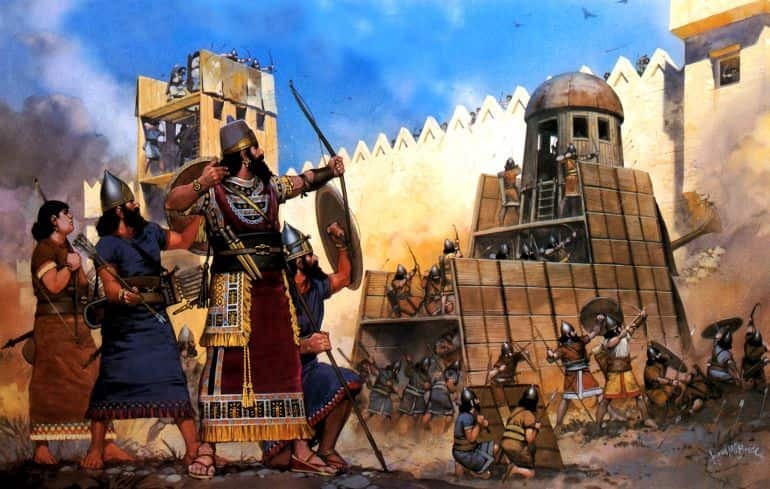 The Assyrians were known for using imposing siege weapons and towers. Illustration by Angus McBride. In a conventional sense, when we talk about Assyria, our notions pertain mostly to what is known as the Neo-Assyrian Empire (or the Late Empire) that ruled the largest empire of the world up till that time, roughly existing from a period of 900-612 BC. To that end, many historians perceive Assyria to be among the first ‘superpowers’ of the Ancient World. But as the dictum suggests – ‘when the going gets tough, the tough get going’. In that regard, Assyria’s rise to power was ironically fueled by its land’s initial vulnerability, since it was beset on all sides by enemies including nomadic tribes, hill folks, and even proximate competing powers. And to protect their rich and plump grain-lands, the Assyrians systematically devised an effective and well organized military system (from circa 15th century BC) that could cope with the constant state of aggression, conflicts, and raids (much like the Romans). Over time, the reactionary measures translated into an incredibly powerful military system that was inherently tied to the economic well-being of the state. And the once-defenders now turned into aggressors. So in a sense, while the Assyrians formulated their ‘attack is the best defense’ strategies, the proximate states became more war-like, thus adding to the list of enemies for the Assyrians to conquer. Consequently, when the Assyrians went on war footing, their military was able to absorb more ideas from foreign powers, which led to an ambit of evolution and flexibility (again much like the later Romans). These tendencies of flexibility, discipline and incredible fighting skills (that ranged from chariots, archers to siege tactics) became the hallmark of the Assyrian warrior culture that triumphed over most of the powerful Mesopotamian kingdoms in Asia by 8th century BC. …regime supported by a magnificent and successful war machine. As with the German army of World War II, the Assyrian army was the most technologically and doctrinally advanced of its day and was a model for others for generations afterwards. 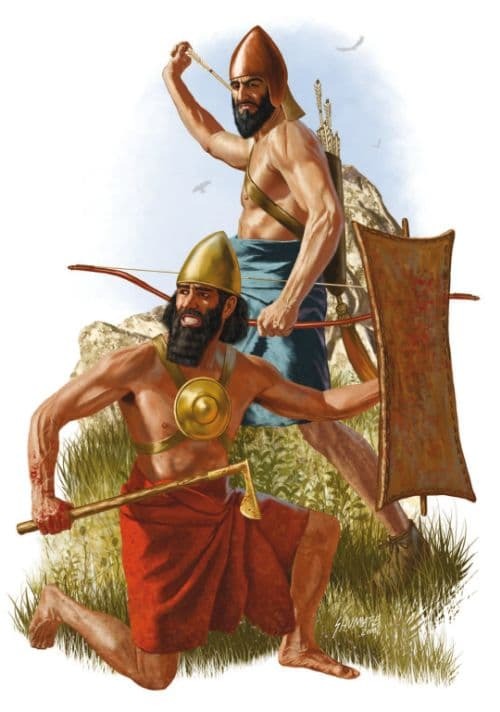 The Assyrians were the first to make extensive use of iron weaponry [and] not only were iron weapons superior to bronze, but could be mass-produced, allowing the equipping of very large armies indeed. The Scythians modified some elements of the conventional corselet by arranging the metal (or leather) bits in a ‘fish scale’ like pattern. Illustration by Angus McBride. Oddly enough, while the socio-political effects of the Scythian incursions in the Middle East can be comprehended to some degree from contemporary (or near-contemporary) sources, historians are still mystified by the logistical and organizational capacity of the military of these nomads from the distant steppes. But it can be hypothesized that like most nomadic societies, the majority of the adult population was liable for military service (including some of the younger women or Amazons). Now the tactical advantage of such a scope translated to how the bulk of the early Scythians had mounted warriors – mostly lightly armored with leather jackets and rudimentary headgear. Celts were often lightly armored. Illustration by Angus McBride. As opposed to the more specific cultures mentioned in this list, the Celts rather represent various population groups that lived in different parts of Europe (and even Asia and Africa) after the late Bronze Age. Now in spite of their ambit of diverse tribes, the Celts spoke pretty much the same language, while also showcasing their definitive art styles and military tendencies for the most part of their history. Pertaining to the latter scope, the ancient Celtic warrior had the reputation of fearlessness and ferocity – qualities that were conducive to many close-combat scenarios. 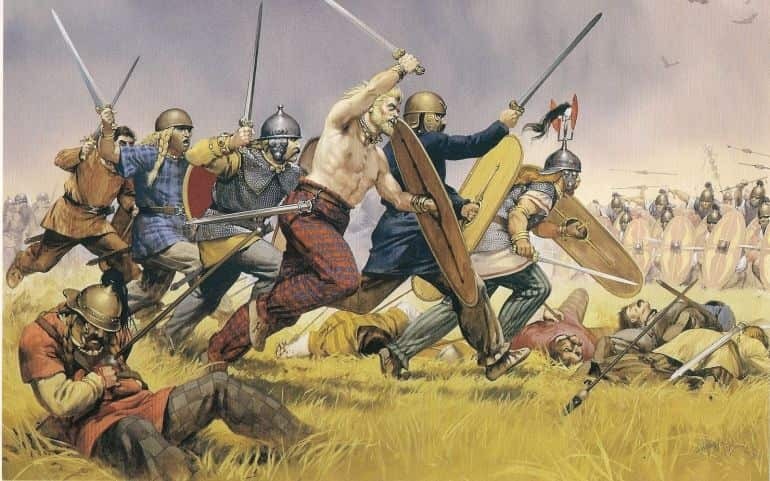 Suffice it to say, the Celts served as mercenaries in various parts of the known world, ranging from colonies in Anatolia to the service of the Ptolemaic ‘Pharaohs’ of Egypt. The Romans…were terrified by the fine order of the Celtic host, and the dreadful din, for there were innumerable horn -blowers and trumpeters, and…the whole army were shouting their war-cries…Very terrifying too were the appearance and the gestures of the naked warriors in front, all in the prime of life and finely built men, and all in the leading companies richly adorned with gold torcs and armlets. 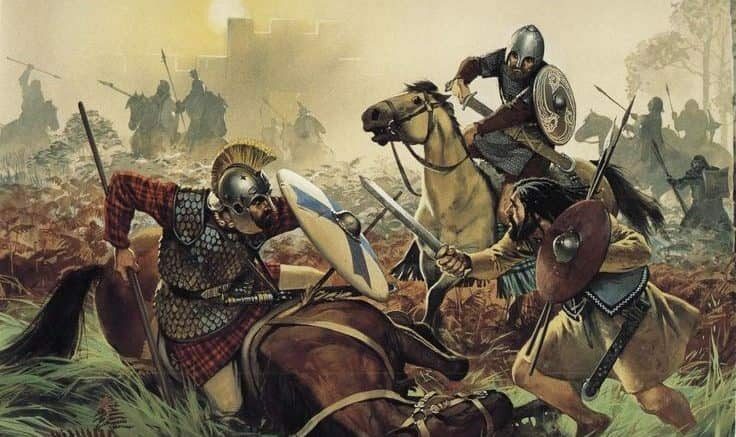 Interestingly enough, while the popular notion of a Celtic warrior is often limited to the physically imposing infantryman brandishing his shield and sword, a few ancient accounts also talk about other types of Celtic soldiers and formations. For example, Julius Caesar described how some of his Gaulish foes used light chariots with impressive maneuvering skills on the battlefield. And even more than two centuries before Caesar’s time, Hannibal made use of heavy Celtic cavalrymen who were instrumental in dismantling their Roman counterparts in the Battle of Cannae. Trajan engaged the war with hardened soldiers, who despised the Parthians, our enemy, and who didn’t care of their arrow blows, after the terrible wounds inflicted by the curved swords of the Dacians. This was the rhetoric uttered by Marcus Cornelius Fronto (in Principia Historiae II), and the statement pretty much sums up the presumably devastating effect of the Dacian ‘specialty’ weapon of falx. An Indo-European people, related to the Thracians, the Dacians inhabited the regions of the Carpathian mountains (mostly encompassing modern-day Romania and Moldova). Interestingly enough, from the cultural perspective, they were influenced by the urbanized Hellenic neighbors to their south, the Celtic invaders from their west and the nomadic Scythians from the Eurasian steppes – thus leading to a unique admixture of martial traditions that was pronounced in their warrior culture. Now from the archaeological perspective, the skilled Getae-Dacian craftsmen showcased their penchant for furnishing iron weapons, as is evident from the profusion of iron reduction furnaces found across the ancient lands inhabited by the people, circa 300-200 BC. Intriguingly, beyond the weapons manufacturing scope of the Dacians, there was a social angle to the warrior society of these people, aptly represented by the aforementioned falx – a scythe-like weapon that curved ‘inwards’ sharply at the tip. In that regard, these scythes, with their ability to puncture both helmets and shields, probably had their origins in rudimentary agricultural tools used by the farmers. So simply put, the dual nature of this weapon-type rather mirrors the dual role played by the ordinary folks of the Dacian society who frequently had to don the mantle of soldiers and protectors. They were also complemented by the perceived upper-classes of the Dacians society – men who were allowed to wear caps and keep long beards. 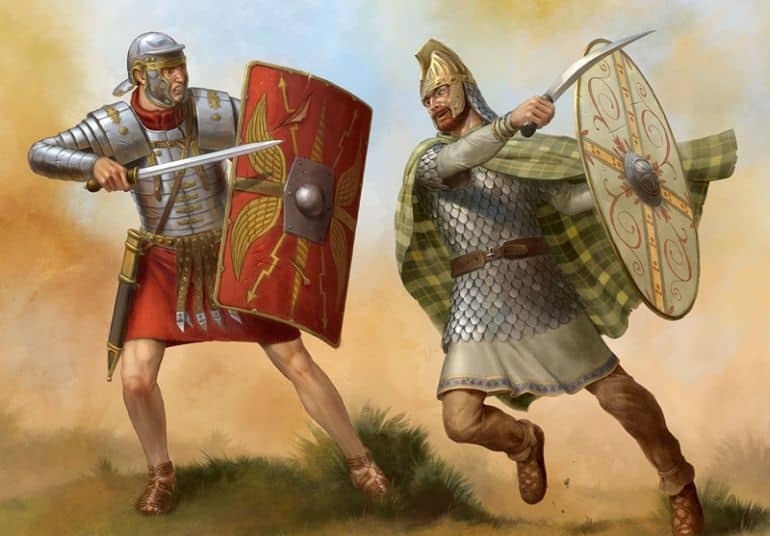 Dedicating most of their time in pursuit of martial activities, the Dacian elite provided the warriors who filled the role of tribal warlords, officers and even reputable divisions within the army (often wearing Sarmatian style scale mail and hardy Thracian helmets, while being equipped with the deadly falx and smaller sica). Moreover, there is also evidence of Dacian priests who used weapons like bows and spears in their rituals, thus suggesting how warfare was an intrinsic part of the Dacian culture. Roman legionaries led by a centurion. Illustration by Peter Dennis. Credit: Warlord Games Ltd.
To talk about the ancient Romans in merely three paragraphs is indeed a fool’s errand. Nevertheless, as most history aficionados would know, the Romans in their greatest extent (circa 117 AD, the year of Emperor Trajan’s death) controlled the largest empire in the ancient world, stretching from Spain to Syria and Caucasus, and from North African coasts and Egypt to the northern confines of Britain. These conquests were all the more impressive considering Rome’s initial beginning (circa 9th-8th century BC) as a backwater region that was inhabited by cattle rustlers who made their camps and rudimentary dwellings among the hills and the swamplands. Suffice it to say, the impressive conquests all over Europe, Asia and Africa were fueled by the ancient Roman warrior culture (and doctrine) that was based on sheer discipline and incredible organizational depth. This was complemented by the inherent Roman ability to adapt and learn from other military cultures. Pertinent examples would include the initial Roman armies that were composed of ‘hoplites’ inspired by the Greeks of Magna Graecia. But over time they adopted maniples that were possibly influenced by other Italic people (and contemporary social conditions). Finally, this organizational scope gave way to legionaries, an ancient Roman equivalent of professional soldiery that was inspired by a mix of foreign influences, including that of Celts and Spaniards. However, the greatest of Roman strengths probably pertained to their unflinching capacity to make ‘comebacks’ from balefully disastrous scenarios – because of a unique combination of (societal) logistics and warrior culture. A pertinent example relates to how the Battle of Cannae (a single encounter in 216 BC) possibly snatched away a significant chunk of the Roman male population. In terms of sheer numbers, the bloody day probably accounted for over 40,000 Roman deaths (the figure is put at 55,000 by Livy; 70,000 by Polybius), which equated to about 80 percent of the Roman army fielded in the battle! 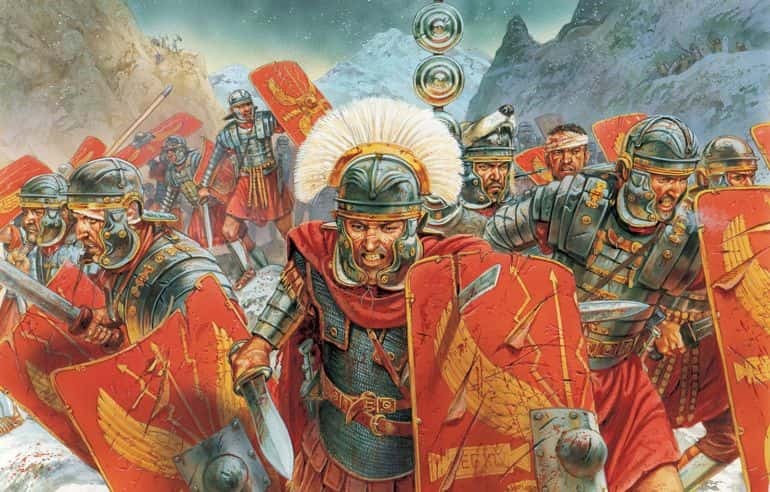 The male population of Rome in 216 BC is estimated to be around 400,000; and thus the Battle of Cannae possibly resulted in the deaths of around 1/10th – 1/20th of the Roman male population (considering there were also allied Italic casualties). So objectively, from the numerical context, the Romans lost anywhere between 5-10 percent of their male population in their bloodiest encounter for a single day. And yet they were ultimately victorious in the Second Punic War. Parthian cataphracts charging the Romans at the Battle of Carrhae (circa 53 BC). The Parthians amalgamated the military tendencies of their nomadic brethren (like the Scythians) and the cultural legacy of the Achaemenid Persians. The result was a feudal society in the ancient times that was headed by powerful clans who maintained their political presence while granting autonomy to many urban and trading centers throughout the kingdom. As a consequence, the Parthian army was dominated by mounted warriors (an effect of their nomadic origins), with the core composed of the famed cataphracts and clibanarii – heavily armored horsemen mounted atop Nisean chargers. These chosen retinues of the nobles were often accompanied by a multitude of lightly-armed horse-archers. At times, especially during periods of protracted war with the Romans, the Parthians also fielded infantry – though they were usually of mixed variety, with preference given to the hardy hill-folks from northern Persia, who were often supplemented by the poorly armed urban militia. In essence, the military of the Parthians mirrored the armies of Europe during the early middle-ages, where the military (and political) leadership was focused on heavily armed mounted warriors, while the rest of the army played a rather supporting role. And these feudal orientations actually allude to the warrior culture ingrained in Parthian military norms, where the ‘knightly’ armored horsemen epitomized the crème de la crème of the Persian society – a cultural legacy carried forth by the future Sassanians. And since we brought up the conflict of the Parthians with the Romans, the Battle of Carrhae (53 BC) can be counted among the first instances when the Romans came across the might of heavy cavalry, which was certainly a departure from infantry-dominated European battlefields of the ancient era. In terms of figures, the Romans had seven legions along with seven thousand auxiliary forces and a thousand Gallic crack cavalrymen; which came to around a total of 45,000 to 52,000 men. On the other hand, the Parthians had around a total of 12,000 soldiers with at least 9,000 of them being horse archers recruited from Saka and Yue-Chi people, and 1,000 being cataphracts (super-heavy cavalry). 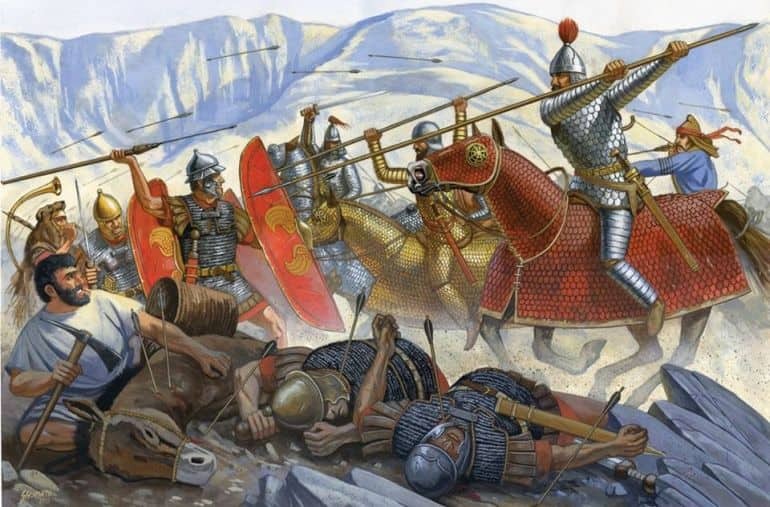 The battle in itself proved the superiority in mobility of the Parthian horsemen, as they unleashed a hail of arrows upon the constrained formations of the legionary forces. The final coup de grace was delivered by 1,000 tightly-packed cataphracts atop their mighty Nicean chargers – when they broke the ranks of the disarrayed Romans, who were already afflicted by the elusive horse archers of the steppes. Unsurprisingly, the unexpected defeat had long drawn repercussions, with the Romans (and later Eastern Romans) in time adopting many of the shock cavalry tactics of their eastern neighbors. Paulus Orosius, the Gallaecian Catholic priest, called the Lusitanian hero Viriatus ‘Terror Romanorum’. Unlike the other ancient warrior cultures mention in this list, the Lusitani (Lusitanians) preferred special tactics used during protracted conflicts, which entailed the very concept of ancient guerrilla warfare. Roughly occupying most of modern Portugal (south of Douro river) along with the central provinces of Spain, the Lusitani were a part of the Celt-Iberian group. And quite oddly, unlike their Gallic neighbors or even kingdoms from across the Mediterranean Sea, the Lusitanian tribes were never warlike in the proper sense of the word. However, they did show their military acumen and even might, when provoked – as was the case during the Hispanic Wars and the campaigns of Lusitanian hero Viriatus against Rome. 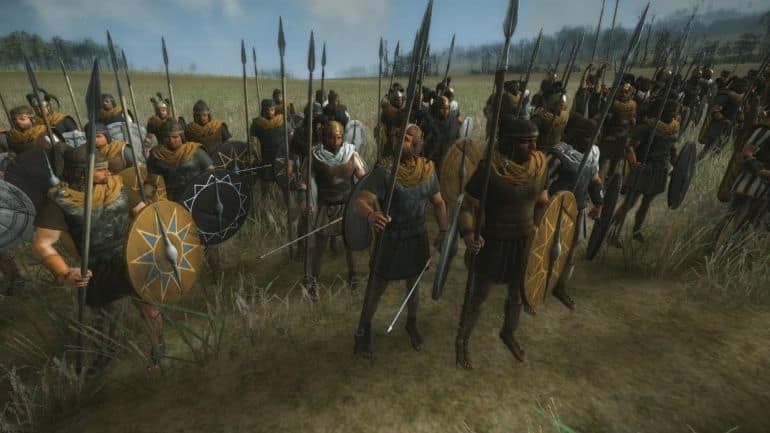 It is estimated that the Romans and their Italic allies lost around an astronomical 200,000 soldiers during the 20-year period of war between 153-133 BC! And even beyond figures, it was the unique essence of unconventional warfare that really made the ancient Celt-Iberians stand out from their contemporaries. As Polybius had noted – the Hispanic Wars were different because of their unpredictability, with Lusitanians and other Celt-Iberians adopting the tactic of ‘consursare‘ (which is sometimes described as ‘lack of tactics’) that involved sudden advancements and confusing retreats in the heat of the battle. Their warrior society also followed a cult of trim physique, with body slimness being rather accentuated by wearing of wide yet tight belts around the waist! And in case we have not attributed or misattributed any image or artwork, please let us know via the ‘Contact Us’ link, provided both above the top bar and at the bottom bar of the page. To that end, given the vast ambit of the internet and with so many iterations of the said image (and artwork) in various channels, social media, and websites; it sometimes becomes hard to track down the original artist/photographer/illustrator.